Sugarhosts Review 2019: Is Sugarhosts a Good Hosting? 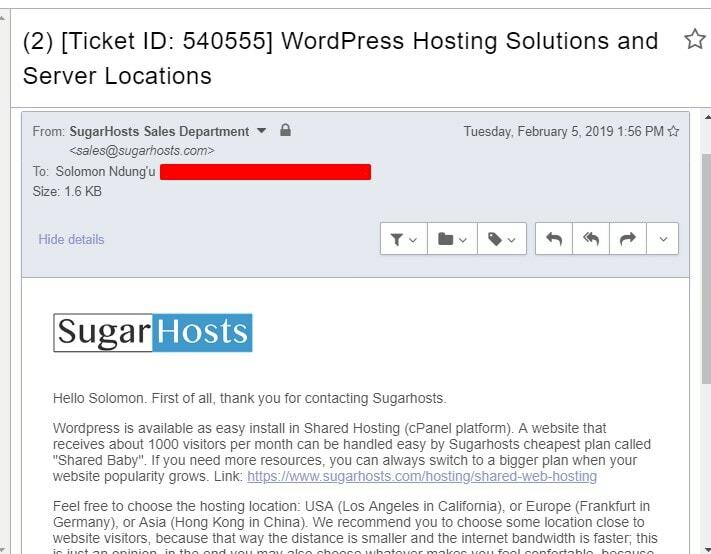 Sugarhosts is a web hosting company with a presence in a number of countries around the globe, including Australia, Taiwan, the U.K., the U.S., China, and Hong Kong. The hosting vendor is owned by Magic Particle Limited, an Irish company. Sugarhosts is a web hosting provider owned by Magic Particle Limited, an Ireland-based company. The hosting vendor operated independently since 2009 when it was founded, but was acquired in 2018 by Magic Particle Limited. Sugarhosts hosting solutions are available in a number of countries around the world, including Australia, Taiwan, the U.K., the U.S., China, and Hong Kong. Its website is available in English and Chinese. Sugarhosts houses its servers in multiple data centers located in several continents around the globe, including Europe, North America, and Asia Pacific. Its servers use XEN technology with powerful Intel Xeon CPU. The vendor promises not to oversell its servers to ensure that all its clients’ websites maintain fast loading speeds. It also provides large SSD-cached SATA RAID disks under its VPS hosting for businesses with large and complex websites. This hosting company uses a resource protection system to safeguard its hosting system from server overload. As a result, Sugarhosts can confidently promise its customers 99.9% server uptime availability. Among the operating systems that this vendor makes available to its customers are CentOS, openSUSE, debian, archlinux, gentoo linux, slackware, and Ubuntu. The vendor’s solutions also come with more than 30 pre-built website templates allowing users to get started as soon as they are set up on the Sugarhosts servers. Sugarhosts offers DDoS protection as a standalone solution that users buy separately from its hosting packages. The security package is available as either an on-demand service or as an always-on solution. The package is designed to give your website 100% protection against bots and HTTP floods. Sugarhosts performs free daily automatic remote backups of their servers. 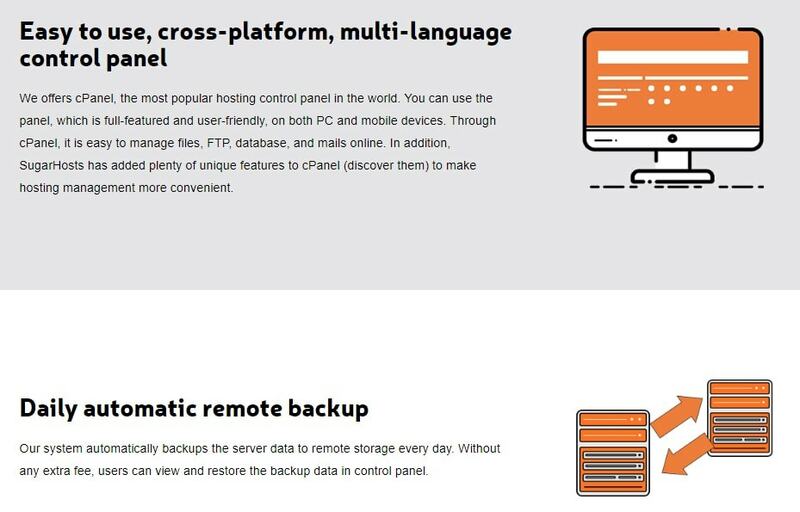 From its easy to use cPanel control panel, you can view and easily restore the backup data following a disaster. 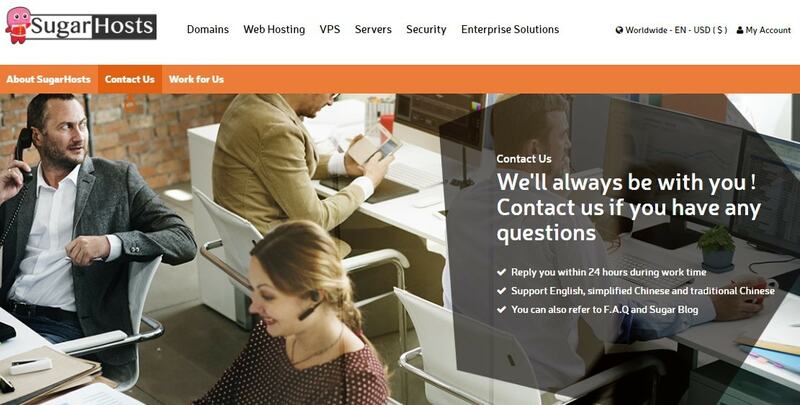 What’s more, cPanel supports both PC and mobile devices. Sugarhosts hosting solutions are quite affordable yet they include pretty advanced features. The vendor’s hosting plans include flexible billing cycles, including monthly, biannual, annual, biennial, and triennial subscriptions. On its website, users can choose their location and the currency in which to view the hosting plans. The currencies included are U.S. dollar, British pound, Australian dollar, euros, Chinese yuan, Hong Kong dollar, and new Taiwan dollar. The hosting firm offers a 30-day money-back guarantee. However, it is important to note that this is only applicable to clients who commit to hosting contracts of one year and longer. For shorter contracts, the hosting provider only offers a seven-day money-back guarantee. Sugarhosts’ technical team works 24/7. You can reach out to them via telephone, email, ticketing system, and live chat. The support staff is excellent and polite with a fast response time. What’s more, if you have an issue that you need them to walk you through step-by-step, the team will be more than glad to do so. I sent them a support email and in less than 20 minutes I had received a comprehensive response. Sugarhosts does not have a knowledge base on its website. That said, it has a fairly detailed blog where customers get updates on its hosting solutions, including the status of its servers. Whether you have a small website or blog or own a large multinational corporation, Sugarhosts hosting solutions tick practically all the boxes for the features you will want to see included. The vendor has invested heavily in both hosting infrastructure and expertise to offer hosting solutions that few other vendors can match. Its availability in both English and Chinese has allowed it to make significant headway into Chinese speaking countries like China, Hong Kong, and Taiwan. Wondering how Sugarhosts stacks up against other Web Hosting companies? Enter any other Web Hosting company and we will give you a side-by-side comparison.